The morning air is alive with bird song. The mist rises up from the bush floor as a look out my window to welcome a new day. Since we are at the equator, the sun rises and sets at the same time year round, six thirty. The morning air is cool with mist and the dog is stirring on the front porch. About six thirty he lets us know that it is time to take him on his morning walk. Between the birds, frogs, and cicadas there are all sorts of foreign noises to learn here. After the rains, the frogs can be almost deafening, each trying to drown each other out. 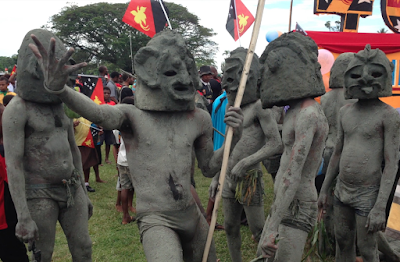 It's Friday, and I have been here in PNG for a week. The difference between the little bush house and where I stayed at PAU is almost night and day. Here it's almost like perpetual camping, though compared to what the people live in, we live richly. It's a simpler way of life out here. No one really plans for the future, and a lot of them don't really have jobs because they don't want to. Even at the Husick (pronounced House-sick, Pidgin for the clinic) there is a very laid back atmosphere. There is no particular privacy, and time is relative. Culture here is vastly different and any other way of life is probably not even considered. The only way to figure out the culture here seems to be to watch and listen. Asking sometimes gets an answer, other times not so much. I've helped out two morning at the clinics so far. They have nurses here that do triage, diagnosing, medication dispensing, and really anything that needs to be done. If there is a major emergency then they will take them to the hospital in Vanimo, but everything is pretty much taken care of out here in the bush. There isn't a single doctor to be had so they manage. It's a tough job, and they do the best they can with what the have to work with. The Hausick is a long building built on stilts with four to five rooms. The long porch has a bench where the patients line up in the morning. By the time it opens at around 8:30 there is a cluster of patients on the benches. Usually women with babies who have walked for kilometers already. Babies attached to hips with slings and little children, sometimes dresses, skipping along beside. Almost everyone gets tested for malaria that comes in, since it's one of the biggest problems, medically speaking. No gloves, or hand washing of any type and surprisingly rarely do they touch the patients. A typical routine of care involves the patient coming, placing their health record book on the desk (if they have one) and the nurse taking a brief history as well as looking at their record. The patient describes their problem, sometimes gets weighed, and occasionally gets examined. It's jungle medicine. I have to admire these men and women though, they live out in the bush, talk with people who really don't speak anything other then a tribal language and are pretty much the entire medical staff rolled into one. They treat, dispense meds, do health histories, and occasionally do dressings and wound cleaning. They can just diagnose and treat (who knows if it's right or not because there really isn't any diagnostic testing). But they do the best that they can, and hopefully I can be a positive influence for a little bit of cleanliness. I helped in the clinic at Klilipau ( a village about halfway to town) Gary had mission stories going and it overall was a neat experience. I saw some possible leprosy, possible TB, and lots of malaria. The kids here are darling! Most don't really bother with clothes, and skin diseases are rampant. I'm pretty sure they think I'm the funniest thing they have ever seen. They stare and stare until I smile at them, then their little faces break out into great big smiles. I love the people here already and am working on my Pidigin. I don't think I will ever really be able to speak it well, but my understanding is improving each day. Yes, I know I haven't been here long, but I've got to try! God is blessing so much. Each and every day I can see God working. It's the most wonderful blessing. The work moves forward here bit by bit. Hopefully we get to fly the plane soon! Gary got permission to fly, so he will be checking out the air strips with an Aussie pilot. I'm excited to do some health care out in the bush.